Ashura of husayn, in the time of awaiting the just government of Mahdi, what is the philosophy of ashura? And what is its role in the history of humanity, and what is its relation and the government of imam Mahdi In the end time? And how does it become a link between the past and the future? Indeed ashura is a timeless land mark of all worlds, and its manifestation means a struggle between right and wrong, between good and evil, between virtue and vice, between light and darkness, and between the troops of God and that of Satan, between faith and hypocrisy, and that has been on since the dropping of Adam to Earth till the day of judgment, although the actual ashura occurred on the day of ashura in the month of muharram 61 years AH in Karbala, during the reign of Banu umayya, and the caliphate of immorality, debauchery and a drunkard and murdered Yazid bin Muawiyah and those that were pleased with his deeds before and after him, they all deserve eternal torment and damnation like it is in the ziyarat ashura, because one gets closer by cursing and refraining from them, and this includes any one that is pleased or happy with their unjust deeds, and anybody that follow their ways in forming a government and does not believe in a just imam, and follow a honest and right khalifa stipulated by Allah and appointed by the holy prophet peace be upon him. The refrainment and slogan of curse includes all (Oh Allah Curse the entire Umayyad) even though they are related through marriage, whoever is related to them through marriage and is considered their tribe, only if he does accept their beliefs and is not pleased with their deeds, and he refrains from them, and follows the right sect and believes in the imam of his time the infallible, if so he will not be included in the curse and that which is quoted from ziyarat ashura (Oh Allah curse the entire Umayyad) meaning all. This meaning is reported from Sa’ad alumawi he is among the ashab of Imam Sadqi, he cried to imam and asked him am I included in the quotation from ziyarat ashura (Oh Allah curse the entire Umayyad), Imam replied him by saying he will not be included as long as he is with the Ahlulbayt, and is not from the cursed tree mentioned in the holy Quran, as long as he doesn’t like them and does not follow them but rather stayed as the follower of ahlulbayt. Also it is reported: indeed our enemies are from pharaohs, so cursed are the oppressors in the book of Allah through the line and the length of the path, since the first offense in the world the day Qabil killed his brother Habil to the day of judgment, Devine curse is due on injustice and oppressors and those that contradict the Islam and its followers, and this is the preponderance of reason and citation from Quran and Sunnah. God almighty intends to help the religion with his men and all the faithful, indeed the land shall be inherited by the righteous servants of Allah, and from his promise that his religion will be shown over all other religions even if the pagans dislike it. The world are awaiting this day that was promised, there is no doubt that the rightful owners of truth and the truthful and the followers of Ahlulbayt are waiting for the affirmation of the precious state in which Allah will be glorified by the followers of Islam and humiliate hypocrisy and hypocrites, this clearly means waiting for a bright future with the light of God ( the earth is brightened with the light of its Lord) with the justice to come throughout the leadership of a just and infallible imam, he will fill the land with equality and justice after it has been filled with oppression and injustice. And there is no doubt that the world in its reality and conscience is waiting for a universal reformer and the day of salvation, even though most of them are oppressors and misguided and misleaders but the atmosphere of humanity and the unjust government and unfair is need of right to human dignity and reasonable freedom, that is why the whole humanity is waiting for the promised day, the day to be free from oppression, injustice, and immorality. The waiting of the world and the real followers is an introduction from the introductions towards achieving the Devine promise and the formation of his government, which the world is still waiting for and which did not govern the earth entirely, though the heavenly books were revealed, and prophets and messengers were sent, but the world will not be revealed for a day to such divine justice. Then the waiting and the awaited in their meaning and like it is in the culture of shia and what is toughed in the schools of Ahlulbayt and with their followers with love and desire, tears and the call out for help, and refinement of the souls and the believe in the unseen and righteous deeds and in useful and sincere knowledge and spiritual and moral proximity. From the awaiting believers and the righteous souls are paving their souls in order to serve their master the imam of their time is from the things that links ashura of imam husayn and the waiting for imam Mahdi, this are some features of the ashab the awaited. Indeed waiters in the time of occultation and in the circle of waiting in the days of ashura in every year and their interactions with the issue of the master of martyrs, and in every era with manifestation of grief and sorrow, they are of three varieties: there are some of them who disobey Allah, and his messengers and the imam of their time and they do not take any lesson from ashura, there are some that make it obligatory upon themselves a calculated patient, holding their ground not to disobey and stands for good deeds and endures calamities, and there are some which are fewer (and few from my servants are grateful ) who refine their souls with the greatest jihad and overstates in his jihad and the jihad to win the satisfaction of his master the imam of his time. It is evident that not everything is a miracle, even if it is the life of Imam Mahdi (may God hasten his appearance) and longevity of his miracles, ashura has a link and is close to waiting for imam Mahdi and the future of the world. It is reported from our master, the master of martyrs Imam Husayn, he said: “ we have twelve Mahdi, the first is the commander of faithful Imam Ali and the last of them is the ninth son from my sons, with him God will give life to the earth after it death, and show up Islam over all other religions, even if the pagans dislike it “ and this the meaning of the desired goal of the revolution of Imam Husayn and the renaissance of ashura eternal, it will be by the appearance of hujja. This strategy of human conflict in human history through the ages and ages, and in our time and the future till the appearance of Mahdi, this is what sends human to their perfection and happiness and it the servitude to God almighty, purely without polytheism and without showing is off, and freedom from mind that inclines towards evil, and breaking the chains of ignorance the first and second, and reaching to eternal happiness. And the revolution of Imam Mahdi in the end time, is the continuation and permanence of the revolution of husayn and its premises of ashura, and this is stated in the light of the philosophy of history, like it is stated in Hadith from the Holy prophet, the real avenger of the martyrs of Karbala and all the unjust killing, indeed he is the waliy of God, on the day of his appearance he will raise a flag bearing the slogan of husayn. It is said in ziyarat nahiya (if you will delay me for some time and give me your decreed victory,so that I won’t call for help every morning and evening and cry blood instead of tears) indeed prophets and their heirs from Adam to Muhammad they are all reasons of updating Islam in its general meaning, from tawheed and submission and believe in the origin and return. The effect of prophecy and their heirs, and the circle linking the past and the future is the master of martyrs Imam Husayn and the day of ashura, it is the link between the righteous in the past and the righteous in the future. And by the appearance of their guardian (imam Mahdi) the dream of the prophets will be achieved. The blood of imam Husayn, Ahlulbayt and their companions grew into a tree of tawheed ( if the religion of Muhammad will not straighten unless with killing me oh swords take me) if islma triumphed in the battle of khandaq, and a blow from Ali was better than the worship of the two races (humans and jins ) and the whole infidelity emerged and face Islam and with the killing of amru bin abduwad Islam triumphed and on the day of ashura the whole faith conquered hypocrisy after the death of the prophet the usurping of the succession and the succession of ungodly yazid, which the root of his succession was unfair since the Messenger was lying on the ground, when the prophet was getting buried the trouble started reaching the time of the Umayyad and the Abbasid up to the present time , indeed yazid and people like him wanted to obliterate Islam and erase it. Like he said ( Hashims played kings, but there was no New and no revelation sent down). Between Imam husayn and falseness of history he revolted against injustice and corruption and wanted to reform the nation of his grandfather the holy prophet till the day of judgment, so that nothing will remain of the Umayyad except curse of Allah upon them and that of his messengers and the entire human race , however the few pending evil of those that followed their way and where pleased with their deeds from hypocrites and contemporaries, and those that people know by depending yazid the cursed that they even say he is among the twelve companions, those that the prophet notified us about them, the righteous captains that praise God. 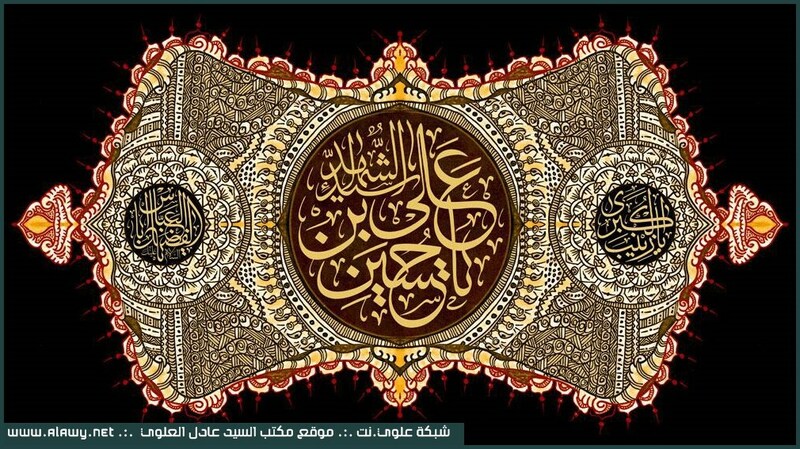 Imam Husayn will remain the guidance lamp and the rescue ship, and the beacon of freedom and dignity for all generations, as ages and time pass by, and whoever is satisfied with act of yazid in his words and deeds and pleased with his government and plans it is inevitable he will be among the troops of yazid because he liked their work. I end this by praising the holy prophet and his household.